He is the founder and CEO of the company Mass & Heat Transfer Technology Pty Ltd, and we are proud to call him one of ours! 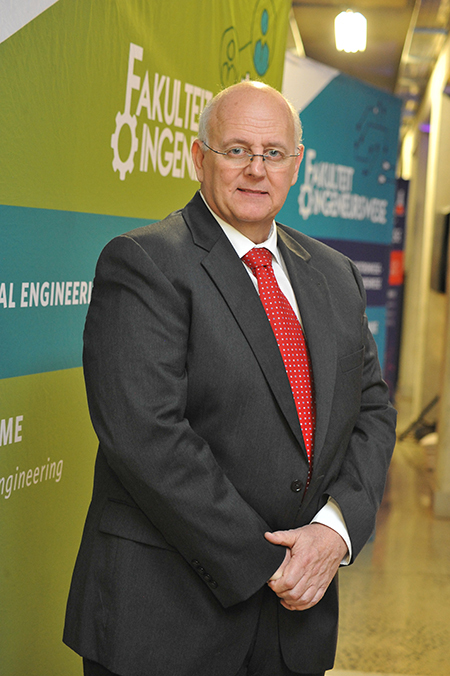 Christo van den Heever was recently inaugurated in the Faculty of Engineering’s Alumni Hall of Fame during a formal occasion that was held at the NWU’s campus in Potchefstroom. Christo matriculated at Welkom Gimnasium and graduated from the former Potchefstroom University for Christian Higher Education in 1982. He has 35 years’ experience as a certified, professional mechanical engineer and currently performs work of a conceptual nature in engineering, design and development. He provides guidance to senior and lead process engineers, mechanical engineers and project managers. Christo’s engineering company was responsible for the designing, construction and commissioning of South Africa's first continuous hydrothermal liquefaction plant, which was launched at the NWU in March 2017. This resulted in the production of bio-oils, bio-char, bio-chemicals and biogas, and is headed by Prof Sanette Marx. Christo is also the sponsor of an annual third-year student engineering competition at the NWU, which demonstrates his loyalty to and good relations with the faculty. When asked about his recipe for success, Christo says it’s not about making money, but rather about identifying a need that people might have regarding businesses, and fulfilling it properly. “Success requires hard work and includes a lot of failed attempts,” he says. “It also requires a great love and passion for what you do – no matter what the product you intend to deliver or the service you will render. You have to have a love for what you do! “My advice is to rather do everything in your power to offer value for the client’s money spent, than trying to impress or please the client. When you do that, you are focusing on the project’s outcome. Also remember that money does not equal success – the feeling of positively contributing towards a need, now that’s success,” he says. About his inauguration in the faculty’s Hall of Fame, Christo says it’s an unexpected and very special gesture that he will cherish forever. “For the very first time in my 35-year career, I’ve been told that I’m ‘successful’. I usually just get a ‘thank you for the work done‘, or a payment in my bank account. This is a very special moment in my life and I am honoured to receive this special award,” he says. It is a great honour for the NWU to inaugurate Christo van den Heever as an Esteemed Alumnus of the Faculty of Engineering.